The walls of Bakehouse drip with the history of Australian music. Around 400 musicians – local and international – pass through the studios every week. 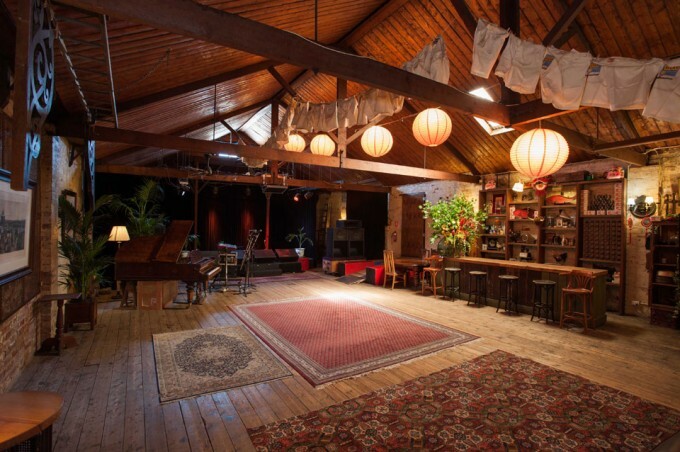 One of Melbourne’s great secret locations, this is where the music is created, musicians meet, form bands, write songs, rehearse, record, shoot film clips and photos and generally prepare the presence that the general public finally witness. Bakehouse is a secret hideout where international rock royalty hang out with Melbourne’s musicians. The studios were described by Elvis Costello as “some of the best rooms in the world”. Owners Quincy McLean and Helen Marcou fell in love with Melbourne’s live music scene during our great city’s punk explosion in the late 70′s. In 1991 the pair set up the recording studios in Bakehouse Lane, Fitzroy in the old York St Studios (est. 1978) and the rehearsal space on the site of the old Stable Sound Studios (est. 1985). York Street has its place in history with bands like Whirlywirld, TISM, Primitive Calculators, and Australian Crawl. Bakehouse has featured in the Paul Kelly documentary ‘Stories of Me’; ‘Persecution Blues – The Battle For The Tote’; Nick Cave & the Bad Seeds ‘Do You Love Me Like I Love You?’ (shot exclusively in London, New York, Berlin, Stockholm & Bakehouse! ); in hundreds of video clips, and was recently named a Melbourne Music Landmark in the Melbourne Music City tourism app. In the early days, Bakehouse helped incubate classic artists like The Avalanches, The Dirty Three, Chain, Grant McLennan, David McComb, Cosmic Psychos, and Spiderbait. Over the years, acts like The Saints, Paul Kelly, Rowland S. Howard, The MC5, Mark Arm (Mudhoney), Evan Dando (Lemonheads), Tool, Janes Addiction, Deftones, Augie March, Little Birdy, The Panics, X, Died Pretty, Steve Kilbey, The Triffids, Beasts of Bourbon, The Scientists, Dallas Crane, Sufjan Stevens, Dave Stewart, John Butler Trio, Jimmy Little, Blackeyed Susans, Vika & Linda Bull, Daddy Cool, Deni Hines, Underground Lovers, Wanda Jackson, Olivia Newton-John, Jessica Mauboy, Tame Impala, Powderfinger, Bill Callahan, Beth Orton, Cat Power, Elvis Costello, The Rockwiz Orchestra, Ladyhawke, Icehouse, Neil Finn, Pere Ubu and many more have passed through the Bakehouse doors.